Before it was common to turn toys and board games into movies, John Landis had the idea to make a film based on the game Clue. Paramount must’ve really trusted Landis, because they also let him go ahead with his idea to have multiple endings. 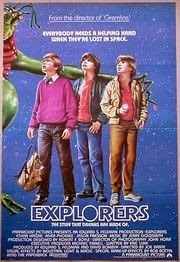 Depending on which theater you watched it in, you could have seen any one of the three. Now in DVD format, the film consolidates the endings into one viewing and presents the first two as “this is what COULD have happened” and the last one as “this is what REALLY happened.” You’d think the multiple endings would create plot holes upon looking back at the events that occur, but they really don’t. Confusion, maybe, but not plot holes. Either way, this movie is so enjoyable that it’s a good lesson in just going along for the ride, not worrying about innocuous details along the way. It’s an amazing premise, but Clue isn’t just a gimmick. It’s a remarkably entertaining movie that still holds up more than 30 years later. Taking place in 1954, six strangers are anonymously invited to a dinner party at a mansion. Unclear what exactly is going on, they are forced, by the butler, to solve a murder. The humor in Clue is very self-aware. Vaudevillian at times. Much like the movie Airplane!–except it does it without compromising the seriousness of the story or distancing itself from its audience, causing them to become less invested. Sort of like what Mel Brooks achieves in The Producers. It doesn’t concern itself with committing to being a true comedy, but it also doesn’t just jarringly add jokes intermittently. They’re always appropriate and always smoothly transitioned to. Amongst the ensemble cast, Tim Curry grounds the entire film as the eccentric butler who always seems to be one step ahead. The dialogue often borders on Tarantino-ian with its snappy banter between characters. Perhaps an inspiration for The Hateful Eight (I’m half joking). The script is carefully calculated and makes all the right decisions with pedantic attention to detail. It doesn’t force character depth, because it knows it doesn’t have to. This allows the plot to swell nicely, leaving us on the edge of our seats pretty much the entire time. The runtime is short, and it actually spends almost 30 minutes towards the end recapping the scenarios in order to help everyone figure out whodunit. It executes this in a fun way, though it’s obviously trying to reach a time limit. But it’s a small price to pay for all the entertainment it provides. When a movie is 90 minutes long, you assume that it either has not much to cover or it’s perfectly precise with every detail. This is Rocky, so you can nix the latter. The story for the 4th installment is stretched way too thin, which is probably why there are so many montages–even for a Rocky film. At one point there’s a 2 minute long flashback montage to the tune of some generic ’80s song. It’s supposed to be Rocky reminiscing on his life and career, but some of the things don’t even make sense why he would be reminiscing about them, given the context. It’s really just a bunch of unconnected and randomly selected scenes splunched together recapping the series thus far–much like a TV show does towards the end of its run as an homage to its fans. It’s weird and out of place. Although, the first training montage is perhaps the best we’ve gotten in this series so far. Before I go on, my summary is going to reveal a spoiler. Since it occurs within the first 30 minutes of the film and propels the entire story, I think it’s important to mention. Soviet fighter, Ivan Drago (Dolph Lundgren), comes to America to take on American talent. His people claim he’s the next big thing and that he can take down any US boxer without much of a fight. His punch registers more than double the PSI of an average heavyweight fighter. Apollo Creed takes this taunting personally and feels it’s his duty to defend America’s honor by fighting Drago. Creed hasn’t fought in 5 years and comes out of retirement way too quickly. He gets carried away, rushing into the match without really training much beforehand. So when Drago punches Apollo during the match, it lands so hard that it kills him. A death that should have been emotional ends up feeling comical. Creed definitely doesn’t get the proper treatment. So Rocky, now furious, decides to take matters in his own hands and avenge Creed’s death–which is apparently a more important issue to him than surviving to be with his wife and son. He goes to Russia to train so he can beat the apparently unbeatable Drago. It’s a suicide mission. Besides the dialogue being cheesy and having one too many sappy speeches, the script makes some questionable choices. For instance, one of Drago’s few lines not only is unnecessary, but it ruins the moment of Apollo’s death. In regards to Creed getting knocked out, the Soviet says, “If he dies, he dies.” It’s absurd! I mean, Drago has barely said a word, why not keep it that way? If anything, it would have been better if we got a bit later on where Rocky tries to get an apology from Drago and he refuses. Then, maybe, would it have justified Rocky’s vendetta. Otherwise, his rage just feels forced and contrived. Rocky IV is uneventful and unnecessary. It’s like Stallone just ran out of creativity. He just loves this formula that he’s discovered so much that he uses it once again here. But this time, it feels much more empty. You can’t help but feel like Creed’s death is only there to justify the existence of another movie. Because it’s the only important thing that happens in this installment. The rare bright spot in this film is the break-out performance of Lundgren. He remains stoic as long as necessary, truly making the audience believe that he’s actually an evil Soviet fighter. But his villainy will be mostly in vain. Paulie is also very important in this story. While he was sort of obnoxious in the previous couple of movies, his presence helps ground the story amidst the craziness of the 1980s. His salt-of-the-earth nature constantly reminds us of Rocky’s humble roots–and of this film series’ humble roots. This nuance was undoubtedly inadvertent, however important. But it’s not even close to enough to save this film. Where Rocky III is ’80s in its over-the-top silliness, bordering on fun, Rocky IV is ’80s in its attempt to solve the Regan-era Cold War politics–which it doesn’t. At least the 3rd film redeems itself in the 2nd half. This one spirals into near-nothingness. It’s hardly any fun. It’s a movie that has contrived an event to kill off a character so that the other character can avenge the death of his friend, which didn’t even need to happen in the first place. As much as I wasn’t crazy about Rocky III, I could watch it again. It’s entertaining. But with this one, I sat anxious waiting for it to end. As being more of a fan of European Vacation than its predecessor, I still rank the two films equally due to the fact that, although funnier, this sequel is terribly written. The script is fine in terms of the humor–the jokes are funnier and more well-constructed, and the situations are seen all the way through to the end. But in terms of the plot, nothing is resolved. And in that aspect, it makes the sequel seem much more unnecessary. 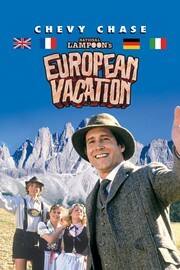 In National Lampoon’s European Vacation, the Griswold family goes to Europe on a trip that they won on a game show. Antics ensue and the same sort of shenanigans that we see in the first Vacation film happen again. I find myself laughing out loud more during European Vacation. The anticipation of the farce that we see in the first film makes for a more enjoyable experience all around. The characters handle the situations in much more realistic ways. But it’s far from perfect. The plot is just stretched way too thin. There isn’t any end destination. It’s a lot of action with no climactic result. The conflict doesn’t even start until 2/3 of the way into the film–right about the time when the comedy starts to lose its overall momentum. The humor is much less dated, and the writers do a great job of not relying on just calling back the jokes from the first film. The children are incorporated a lot more and it feels like much less of a device to showcase Chevy Chase’s talent. It’s too bad that the plot is pieced together so terribly, because this would have certainly helped the franchise reach a new level. But at least we still have a lot of laughs. The third installment in the Mad Max series has Max (Mel Gibson) getting caught in Bartertown–a desert community powered by pig feces. In order to get his stolen vehicle back, the town’s evil queen, Aunty Entity (Tina Turner), requires him to kill the leader of the feces refinery. When Max refuses to do so, he gets banished from the town. In the second part of this film, Max gets found in the desert almost dead by Savannah (Helen Buday)–a dweller who is part of a small desert tribe of kids that thinks that Max is a savior named Flight Captain whom they’ve learned about over the years. I know it sounds confusing, but it’s the intricate premise that sets this film apart from the rest of the series. The first two are definitely groundbreaking in terms of cinematography, but this one finally gets a good script that learns how to utilize subplots. Although we are unclear of the time lapse between films, we know it’s been quite a few years. The filmmakers decide to forget all about Max’s past, as this could very well be a standalone movie. And if it wasn’t for the increasing depth of our lead, it could very well have been. It’s not quite in the same likeness as the first two films. As the previous installments feel like gritty ’70s films, this one is definitely an ’80s one. Not that that’s a bad thing. In fact, it forces the film to take itself less seriously. We get great humorous bits from the tribe of kids. And while the 2nd film (The Road Warrior) may be my favorite in the trilogy, this one just feels less dated. The action sequences are far more intricate and modern. The vehicle fights in The Road Warrior are much more static than the ones in this film. 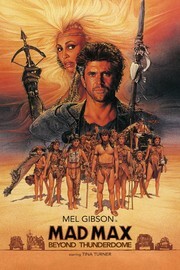 But much of Beyond Thunderdome feels like a drawn-out spectacle that makes itself seem more important than it really is. The name of the film itself doesn’t really make much sense after watching the movie. I think they called it “Beyond Thunderdome” because it sounded cool. I guess “Beyond Bartertown” doesn’t really have the same intensity to it. The thing these films have going for them the most is a likable lead. Gibson carries this series well. It’s going to be interesting seeing the new films without him at the helm. Growing up watching this movie several times, it holds a special place in my heart. It contributed greatly to every dream that I had, for every adventure that I wished to go on, and for every project that I had. It was always in the back of my mind, and it’s safe to say that it still is. I relate to Ben (Ethan Hawke) a lot in the sense that I approached every adventure with eyes wide open and always believed in something big no matter how impossible it seemed. I’m also a sucker for nostalgic pop culture references, of which this film has tons of. The script is very good and so is the direction by Joe Dante. The characters may not be extremely deep, but they each have very distinct archetypes. Most people say that the issue with this film is in it’s 3rd act, which seems kind of unfinished. However, this is not a knock on the filmmakers as this was the studios fault for rushing the editing for an early release date. The filmmakers weren’t happy about this and claim to never have gotten the film out that they had wanted to make. They didn’t get the ending that they wanted and moreover, the characters didn’t get to fully develop as the director had wanted. This is unfortunate, but just imagine how amazing of a film this would have been if that actually happened. It’s already entertaining enough as it is. Some may say anticlimactic, but I say a fun journey with a mysterious climax. Nostalgic and all, this film holds up pretty well.